The objective of this book is to present the fundamentals of reliability analysis applied to the planning and design of industrial and commercial electric power distribution systems. The intended audience for this material is primarily consulting engineers and plant electrical engineers and technicians. The design of reliable industrial and commercial power distribution systems is important because of the high cost associated with power outages. It is necessary to consider the cost of power outages when making design decisions for new power distribution systems as well as to have the ability to make quantitative "cost-versus-reliability" trade-off studies. The lack of credible data concerning equipment reliability and the cost of power outages has hindered engineers in making such studies. This edition of the IEEE Std 493 overcomes these obstacles. 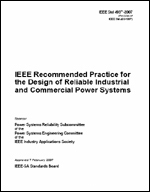 Remarks: Revision of IEEE Std 493-1997.